“Can we really discuss 13 Going on 30 without mentioning Big? 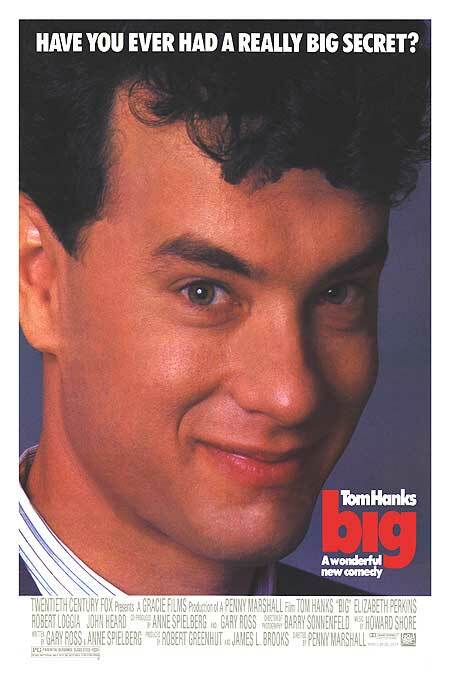 Big (1988): When a boy wishes to be big at a magic wish machine, he wakes up the next morning and finds himself in an adult body literally overnight. 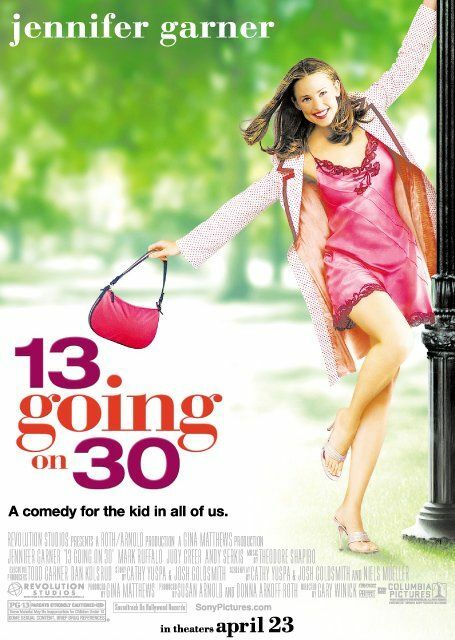 13 Going on 30 (2004): A 13 year old girl plays a game on her 13th birthday and wakes up the next day as a 30 year old woman. There are many words and phrases to explain why some films appear to be very similar to other films: Remake, update, homage, rip-off, mash-up, inspired by, parallels, movie mapping, story patterns, story echo, influences, and good old-fashioned plagiarism. There is a long standing debate on just how much the work of Christopher Marlowe shaped the works of William Shakespeare. But the cycle never really stops as Shakespeare has been accused of stealing from the Roman writer Plautus and Plautus adapted many a Greek playwright. There are plenty of books and articles as critics discuss the similarities of such and such a film. Tomorrow well look at what some filmmakers and screenwriters have to say about the topic. Charles Dickens has been dead for 139 years but that didn’t stop him from having a $132 million film this year. Dickens first wrote A Christmas Carol in just six weeks back in 1843. The book sold well from the start and also received good reviews from critics. I’m not sure how many versions of A Christmas Carol have been made into feature films and TV programs, but I believe the story first appeared in 1910 during the silent film era. The Robert Zemeckis animated version featuring the voice of Jim Carrey shows the lasting value (and box office value) of a good story well told. So last weekend for The 48 Hour Film Project/ Des Moines our team drew “Ghost Story” as the genre in which we had to make a short film. We quickly started connecting the dots and Ghost was the first movie we tossed out as fitting the genre. That lead to jokes about getting a pottery wheel. Other movies with ghosts were mentioned; Field of Dreams, A Christmas Carol, and of course, Ghostbusters. We had discussions about the difference between angels and ghosts. We agreed in general (right or wrong) that in pop culture that angels helped other people while ghosts tend to resolve issues they have before they can move on. We again pointed to the movie Ghost as having bad ghosts that went to the bad place while Pat Swazye’s got to go upward. We pounded out a story concept in about 5 hours and then shot for 12 hours on Saturday, turned in the finished film on Sunday, and it screened tonight in Des Moines. I’ll post a link of our efforts for this Sunday. So it seemed fitting to find a quote today from Ghost screenwriter Bruce Joel Rubin who won an Oscar for writing the 1990 film. I’d hate to admit to how many books on screenwriting I’ve read. I tend to agree you need just one to get you on track and then start writing. (And this blog, of course. Just for a little inspiration.) But with that said, I just starting reading John Truby’s The Anatomy of Story. Truby has been around a long time and has a lot of people who swear by his seminars. (Check out his website Truby’s Writers Studio.) I’m just a little slow coming to the table. But then again his book just came out in 2007. I think I’ll spend a few days pulling a few gems from his book. Here’s the first one. Truby uses the word slavery to mean a way that life is out of balance. (Koyaaisqatsi, right?) Could be slavery to money, a career, an illness, an another person, a significant loss, a worldview, a prison, etc. The number 4 definition of The Free Dictionary reads, “The condition of being subject or addicted to a specified influence.” That’s a wide path. Think about the script you’re writing now and ask how your main character is in slavery. That may help you if you’re having trouble finding an ending.